I’ve been out a lot, not caught much though. I’ve managed a few sessions of late. I’ve split my time between jig & lure fishing with my growing barbel addiction. It’s been tough, really tough. I’ve banked a total of 10 fish in 5 sessions. Not exactly prolific. Let’s look at the barbel first, I’ve been out twice for them of late putting in around 5 hours each time. The first session I was on a nice spot out to open river not far from where two bodies of water meet. I was hopeful on setting out but when I got there the river was moving at such a pace it was, for me unfishable. I stuck a 5oz feeder out and my rod was still being pulled in. So I tried to fish tight to the bank but still had trouble with the flow, so after much frustration I decided to pack up. My next trip saw my in a swim that is facing the end of an island, on one side there’s a weir on the other a lock. I was on the side of the lock so I was casting towards the crease where the two flows meet. Ideal I thought, 5 hours later and no bites; maybe not. The first session I’m putting down to the pace the second session I’m puzzled over. On arrival I saw lots of fish but they were not interested. I think I might go back early in the morning armed with maggots. That I think will bag me a few. So onto the lure fishing. It’s been slow, a heron flew into my usual spot the other day and since then it’s gone quiet and most other parts of the canal have been fishing rather hard as well. So on a recent trip I decided to change things up. I put a much larger bait and jig head on and I changed up my retrieve. Up to now I’ve been using lures 2.5cm up to 5cm; these had been doing me really well, using a jerky, mixed pace retrieve. I changed this up to an 8cm stick worm with a jig head probably 4-5g and went for a much slower retrieve. So I cast out and allowed the jig to hit the bottom, when I was happy it was on the bottom I wound the line tight, I lifted the rod tip lightly to bring the lure up in the water and reeled in the excess line, as I reeled in I lowered the rod tip to allow the jig to settle again before again lightly lifting the rod tip and repeating the process. What I was trying to achieve was the lure coming off the bottom and then fluttering and stuttering back down; I didn’t want the lure to come too far off the bottom, say about 10cm. Basically I was trying to replicate an injured fish trying to swim off the bottom and failing and failing back down before trying again. The theory for the changes was this, it’s getting colder so the fish are looking for more efficient food intake. That should mean larger meals that take less energy to get hold of; so that means to me a bigger lure with a slower action that works near the bottom or on bottom because as it gets colder the fish will most likely find deeper water/the bottom. First cast a bigger than normal perch graced my net so I had a few more casts at the same spot and nothing, not a great start but not the worst. So I moved on; I was under a bridge which is also a main road when out of no where my rod doubled over. A flash of bronze shone through the water and I was greeted by the snarling beautiful face of a pike. By no means my best photo, I know. He fought but not that much so still had a lot of fight left in him when he came to the net. As the bank where I caught him is made up of sharp stones and really is not too fish friendly I unhooked him in the water save him coming off the mat and hurting himself. So that and combined with him taking a chunk out of my thumb I thought it best to snap one quick photo of the fish in the net so I could get him straight back in the water. You can see near the tail a scar, this was one of two large scars that to me looked like they may have been made by a large Zander. The only downside to catching this amazing fish was the fact that I now needed to go home and patch myself up. 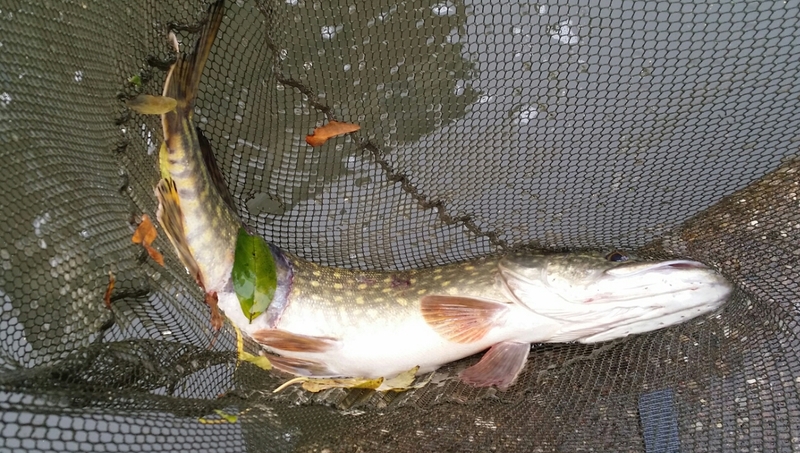 Still I can’t complain as that is the first Pike I’ve landed in over 10 years. It was really nice to land this fish for many reasons. I had been told that there were no Pike in this section so this was a shock to both me and others and I was very pleased to land a fish that was not meant to be there. The other reason is that I made a tactical change based on a gut feeling and it paid off. It’s always nice to when you make a change based on you’re own knowledge and intuition and have it pay off in style as it’s a bit of validation of your theories and who doesn’t like that! I’m finally getting myself geared up for some deadbaiting and will hopefully be going out over the weekend to try and track down some more pike and hopefully I’ll be able to land another barbel soon!! That’s it from me folks; hope you’ve had better luck than me of late. Been a while since I caught a Pike, time for that to change I think! I’ve not gone Pike fishing for a long time, so I’m a bit rusty but raring to get out and find some of these amasing fish. I am fairly spoiled for choice really being in Worcester; there’s the canal, the Severn, Teme, Avon as well as a few lakes near by which are rumored to hold Pike. There’s also the chance of the odd Zander and large Perch which is just as exciting. I’ve located a local lake that from what I’ve heard should hold some small pike and a decent perch or two and it’s a 40 minute walk from my house; happy days. I think this will work out well for me to be able to get back to grips with the tactics needed but also the water isn’t huge. So I’m hoping this will mean they are easier to locate; well that’s my thinking at least. My planned approach is two fold, first I intend to cover the water with some lures (provided it’s not too busy) first so I can have a good look at the place and work out where the fish are likely to be. After that I’m going to set my dead bait rods up and have a sit down and some grub, looking to then move every half an hour if the bites don’t come. When is too many lures too many? NEVER!! I’m going to have to rely on the local supermarket and hope they have something in there that is suitable. So for this session I think I will have to settle for mackerel or maybe some sardines. If they don’t have anything well that’s me going fishing for Barbel instead. Might get chance to use a new float. As I’ve said this isn’t new to me but I’ve not done loads of Pike fishing before so I’m defiantly looking forward to testing my skills against what has to be one of the most beautiful fish in our waters. What you up to this weekend? Got a trip planned or are you out on the water today?